Step into our events & experience public space in a whole new way, animated with music, decor and friendly faces. In a time when social isolation and loneliness are known obstacles to health and happiness, free public events are an important avenue for folks to connect with both each-other, and their city. By activating public space with dynamic social events we hope to start conversations around the important role that these spaces play in bringing people together and providing a gateway into local arts and culture. A new public space under the Granville Street Bridge: “The Chain & Forge” is named after the Canada Chain & Forge Factory that operated on this site during Granville Island’s industrial era. The plaza is a gathering place to enhance social connection through diverse outdoor programming, temporary structures, installations, pop-ups and workshops. Located just off Granville & Pender St, Alley Oop is a colourful laneway transformed by the Downtown BIA and HCMA Architecture + Design to help provide a new space for social interaction and play in the heart of the city. Located on the north side of the Vancouver Art Gallery is a newly renovated plaza designed by Vancouver firm Hapa Collaborative. Acknowledging the colonial legacy of naming in Vancouver the pnaming process for this plaza sought to return decision-making to the original inhabitants of this land and bring more visibility to the local Indigenous languages and cultures. We teamed up with Utown UBC to produce their first annual pride celebration in the plaza outside the AMS Student Nest. The Nest is a student-centered hub of activity, providing a welcoming space for all students to eat, shop, study, and socialize. Located behind Main & Broadway is a colourful laneway layered with art from the cities annual mural festival. Learn more about Vancouver Mural Festival here. Another #moreawesomenow laneway transformation by the Downtown Vancouver Business Association in collaboration with HCMA Architecture & Design. 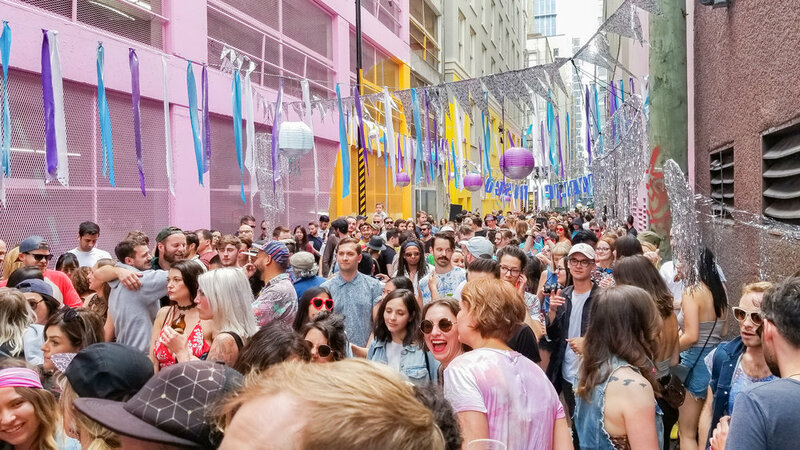 The laneway features a red carpet inspired floor with psychedelic walls and an interactive art installation by renowned international artist, Alex Beim, of Tangible Interaction. Located in the heart of Vancouver’s Davie Village, next to the rainbow crosswalks at Davie and Bute Streets, Jim Deva Plaza is a community serving gathering space and home to a variety of events and activities. The plaza is named after Jim Deva, longtime community activist, founder of Little Sister’s Book and Art Emporium, and advocate for Vancouver’s LGTBQ2+ community. We partnered with the Yaletown BIA to add some new energy to their annual Candytown Festival. An empty patio space on Hamilton Street made for the perfect covered dance-floor. Art nucleus, venue, gallery. The Beaumont is an alternative arts space location in the industrial area of Mount Pleasant. Over the years, the venue has expanded and grown, with events spanning from disco nights to artisan markets. We used the space in collaboration with Transformation Projects for the annual Sparkle Party extravaganza. Visit our event page to learn more.